For the German U19 national team, the EFAF European Junior Championships has taken a conciliatory end on the final day in Cologne. By 48:18, the Germans defeated the team from Denmark. 450 people celebrated the grand Connect fighting spirit of both teams. In the pouring rain at first, the Germans had the luck on their side, won the Cointoss and opted to receiven the ball. No sooner had the offense on the field, the fans were also equal cheer for the first time. 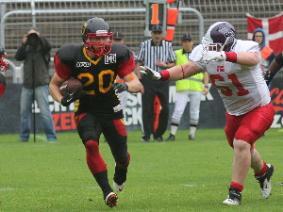 Quarterback Alexander Haupert scored with a nice solo run for the first touchdown of Germany. The extra point was blocked, so it was initially only 6:0. The subsequent, shallow kickoff was the German Special team and secure the offense went right back to work. The Germans remain highly concentrated in this drive and tight end Christoph Winkler grabbed the leather egg in the end zone. The subsequent two-point conversion turned quarterback Alexander Haupert itself to 14-0 score. Denmark made as in the semi-final match against Austria pressure associated with their No-Huddle Offense, but also the German defense was wide awake. Defense back Tim Rademacher began almost an interception, but with luck, the Danes were in possession. Well, Denmark was on the trigger and scored by wide receiver Phillip Boye connection to 6:14, because the two-point conversion was intercepted by the attentive Till Jansen. In the second quarter was the strong offensive line showed at center and team captain Dennis Schwartz their skills. One of the great free blocked gaps then used Maximilian Wessel, the untouched right through the heart of the Danish Defense latched on to a touchdown (20:6). Drive your offense and subsequent interception by safety Mathias Jensen could not use more points for the Danes. Unlike the Germans. After two immensely powerful runs by running back Oliver Trabandt Germany knocked on the Danish Redzone, but a fourth attempt failed partway out first. Then saw again the defense of the Germans for the next highlight. Defensive line player Andreas blade secured to a high snap from the Danish Center and again there were only 20 yards to the end zone. Again, it's Maximilian Wessel, who with the ball in the end zone of the Danes dances her (26:6). After another interception by Till Janssen, the Germans went on his knees and took a clear lead with the half-time. In the third quarter then took quarterback Joao Krapohl the helm at the German national team. He skillfully led his offense equal to the Danish 8 yard line for a touchdown but it was not enough for the time being. Only in the following Offense drive the Germans were new points to the scoreboard. Running back Trabandt Oliver, who should be elected to the German game's MVP later, fueled over 4 yards into the end zone of the Danes. For the successful conversion Jason Harris intercepted a pass from Joao Krapohl to 34:6. Denmark subsequently worked his way forward, but penalties and a sack deep in the backfield with QB Dane Mikkel Thorsen of the strong German defense made all attacks immediately nothing. Only in the fourth quarter the Danes managed another touchdown catch their secure wide receiver Phillip Boye, who is also the Danish MVP title of the game secured (12:34 pm). The German offense then went through punishments life difficult, but nevertheless drew some first downs. After a roughing the passer penalty against QB Joao Krapohl the Danish Safety Emil Rasmussen was dismissed. This was one of the few unpleasant actions of an otherwise extremely fair EM. Wesley Wieland gave shortly after his touchdown with the correct answer to the Danish challenge. Conversion Jason Harris secured to 42:12 interim status. Four minutes before the end of the Danes were cheering then again. Backup quarterback Joachim Hofman keeps the ball and scores a 15-yard run itself, since the conversion fails, it is now 18:42. The final point of the match continued wide receiver Jason Harris with his 41-yard touchdown after a pass from QB Alex Haupert (48:18). A little later, the game is over and the German team could celebrate the bronze medal at the EFAF European Junior Championships in 2013. "I must compliment the team," said team boss Peter Spring Forest. "We have been preparing for the past two days intensively on the game and very well trained. After the defeat against Austria was anything but easy, as the team was still incredibly down. The guys were incredibly hot but since yesterday. To our crew did a very good video work, so that the Danes could no longer surprise us. Our running game was to outstanding. Better today than we could hardly make it. " The audience at the Cologne fair amount Sportpark Berg subsequently celebrated for a long time to the music of the stadium DJ van Eik Owl and thus honored the performance of both teams equally.